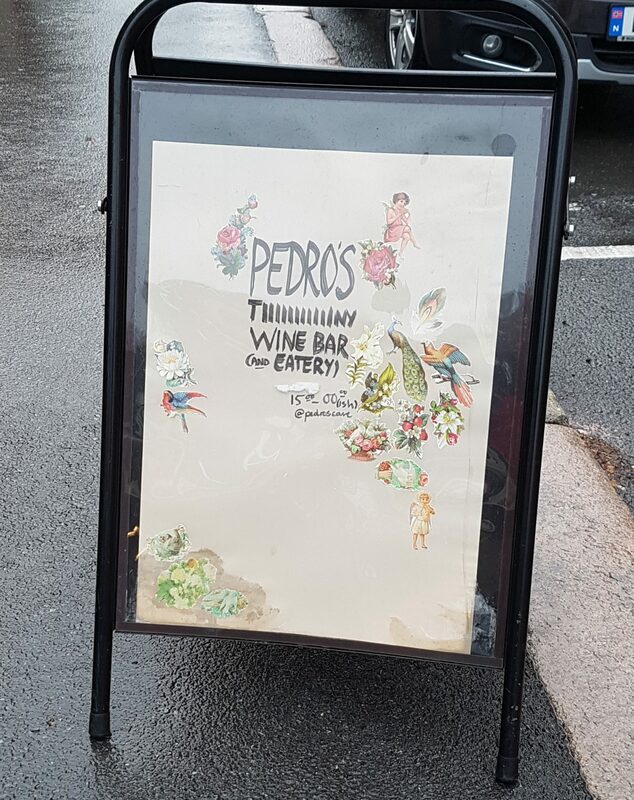 I had just read about the wine bar that Pedro Caiado opened six months ago, when he phoned me to ask about one of the producers that can be found in several posts of this blog. But it was only yesterday that I got a chance to visit his Portuguese place. Let’s just conclude that he has managed to establish a fabulous place. 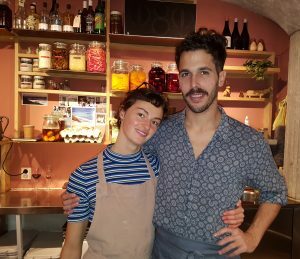 It’s the kind of wine bar that I like, with a strong focus on natural wines, and small, well-elaborated bites to go with them. Quite unusual is that the food also is mostly organic, and from local producers. Pedro is from the Portuguese surfer’s paradise of Peniche, where the winds always blow. But love, what else, brought him to Norway. When I was there he was accompanied by Lise, newly employed, who hails from northern Norway, but has been living abroad for many years, mostly London. Lise has specialized in fermenting, she uses it in some of the dishes, and is also planning to offer courses. The wine list obviously contains Portuguese producers, such as Conceito, Aphros, Mouraz and Pellada. But there are also some of the classics within the natural wine world, such as Cornelissen (Sicilia, Italy), Gut Oggau (Steiermark, Austria), and the French Matassa, Ganevat, Riffault and Robinot, all of whom (Portuguese and “foreign”) should be known to readers of this blog. And there are also up and coming names like the Spanish Ismael Gozalo, Alfredo Maestro and Bodegas Cueva, also well covered here, and Chapuis Frères (Bourgogne, France) and Stekar (Slovenia). It was a late Friday lunch, and I was going to a jazz jam with dinner immediately after this, so I limited myself to three wines from the by-the-glass selection. To go with them Pedro suggested eggs in olive oil with fresh sour-dough bread, ricotta with basil, sunchokes and stingray. I came a short while before they actually opened after the break, so I was offered a cup of coffee, a fresh African highland style selected by Norwegian barista Tim Wendelboe. The first wine was from Moravia, Czech Republic (see a recent post). Gewürztraminer 2017 (Krásná Hora), a 6 months skin-contact white. Not straigh white, that is, it has a red-ish hue. The aromas include gooseberry/raspberry, citrus and some rhubarb, and it has quite concentrated flavours and good acidity. Next out was Nat Cool 2016 (Niepoort). Niepoort is “everything” in Portuguese wine: The house is a traditional port wine producer, and as such a star within several categories such as colheita and garrafeira, but really not bad (read: average) in the other styles either. 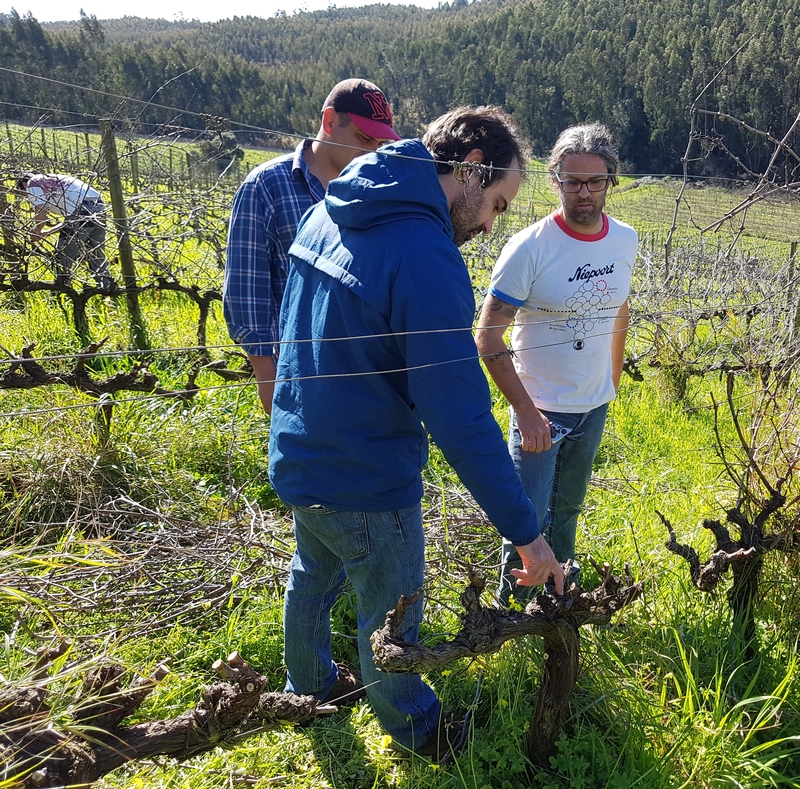 Dirk Niepoort has taken it further, and has now establish himself as a top in several Portuguese regions, and abroad too, like the neighbouring Ribeira Sacra of Spain, and in Austria, as his former wife is from there. This wine is from Bairrada, from the variety baga, made in cement. And it’s really is cool: Light cherry red, almost rosé, smells of strawberry and raspberry, and it has a light touch of tannin. It was served chilled too, which is a good idea. Vale da Capucha is the producer I talked about in the beginning, so it was only natural that I ended this session with a wine from my friend Pedro Marques, who runs that winery. Fossil Tinto 2015 is the current vintage of this touriga-dominated blend, that also exists in a white version. Fossil is an appropriate name, as the winery is located in the Torres Vedras area of the Lisboa region, only 8 km from the sea, and was in ancient times under water. Dark red, smells of dark and red berries, herbs, and it’s a little spicy too. In the mouth it shows a fine, natural, integrated tannin grip and ditto acidity. While sitting in the inner side of the bar I could see Pedro serve all kinds of customers with true respect and patience. I have the greatest confidence that this tiny wine bar has a future place in a city with many good restaurants and bars already. Simplesmente… Vinho is the kind of wine fairs that I love, where you meet only individual producers off the beaten wine track. 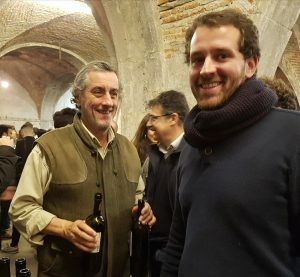 I have already published a short report from the fair itself, I presented a wine from Dão in my weekly column, one from Algarve, then one from the Açores, and finally one from Douro. 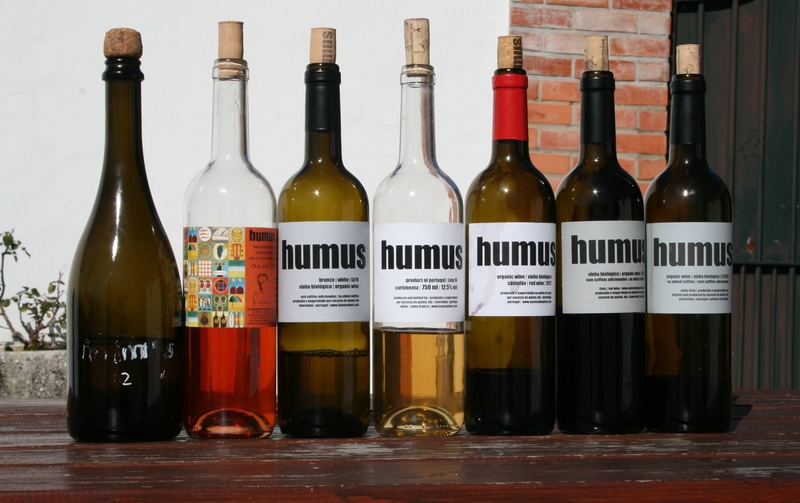 I visited Rodrigo Filipe’s Humus in the Lisboa region before the fair, and lastly I also prepare an article from my visits in Dão. Here are just a few of the rest. Fernando Paiva was one of the pioneers of biodynamic farming in Portugal, in the unlikely region of Vinho Verde, a humid region with a strong Atlantic influence. When looking closer at the map he is based in Lixa, near Amarante in the southern part, not far from Douro. His wines are wonderfully balanced, flowery, and with the acidity in percfect harmony with the rest. The main white grape is loureiro. The Quinta da Palmirinha Loureiro 2016 was oh so light, fresh and citric, with balsamic (pine) notes, and with a fresh natural acidity perfectly well integrated. 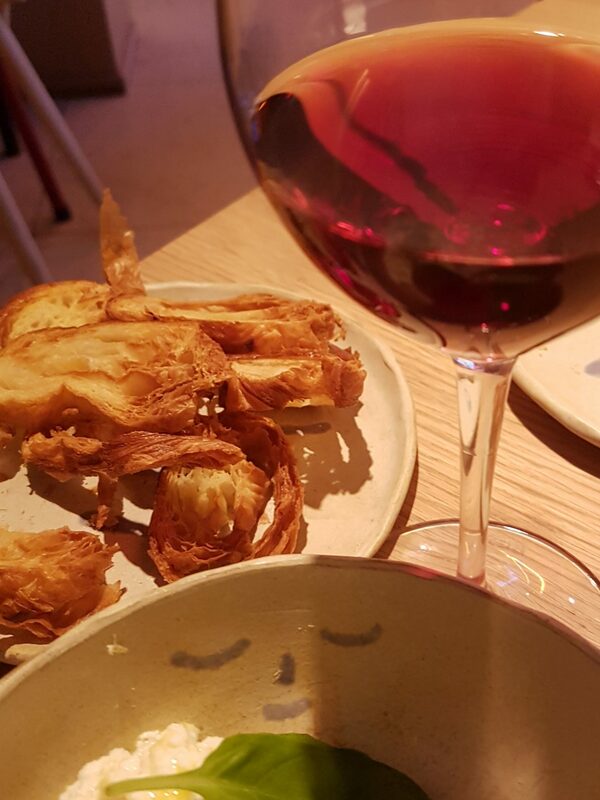 The red Palmirinha 2016 (vinhão-espadeiro-azal tinto), no sulphur added, was dark, with ink, plums, and aciditywise it was in line with the whites (high but hidden). Paiva is also involved in the Mica project, where four producers are joining forces, making greatly enjoyable wines at a lower price. I liked the 2017, an azal-treixadura-avesso tropic/mellow blend at 17 g/L residual sugar. 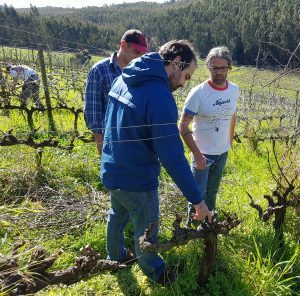 Vasco Croft went biodynamic since the beginning, at his farm near Ponte de Lima, where he has 18 hectares, uses own sheep compost. All wines are made using native yeast. Aphros Loureiro 2016 is light, with lemon, flowers, slender, citric, and with a good, steely acidity. Daphne 2016 comes from a different plot, granitic, more rocky (while the others are sandy). It had 12 hours skin-contact, was then fermented in concrete eggs of 1600 liters and stayed there untill bottling. This wine was full, a bit darker, with aroma dominated by apple. Phaunus Loureiro 2016 stayed 6-8 weeks in amphora, with olive oil on top. The colour was yellow, towards orange; with that white flower aroma that amphoras can enhance; quite full on the palate, somewhat richer, and with a pleasant structure. Phaunus Pet-Nat 2016, bottled while still fermenting; yellow apples, some citrus, and good acidity. The Rosé Vinhão 2017 (sample) had a cloudy peach colour, and a promising acidity. Phaunus Palhete 2016 is a fresh and lovely amphora-elevated wine, made from both red and white grapes with skin-contact for 6-8 weeks. I will come back to this in a wine-of-the-week post. The Vinhão 2017 was pressed by foot, fermented by itself, and no further extraction: Dark, with a violet hue; dark fruits, blackberry, flowers, raspberry, and decent acidity. Lots of character and energy! 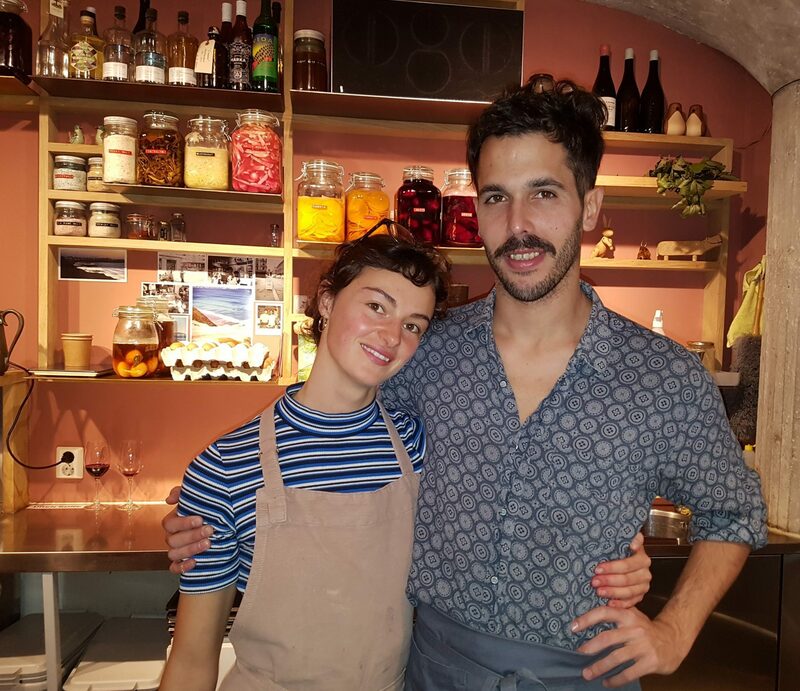 Over the border to Spain, and two Galician wines we tasted at the DOP restaurant, run by the celebrated local chef Rui Paula. Finca Teira 2014 (Manuel Formigo) comes from the inland DO Ribeiro: It’s made from godello, treixadura and torrontés. The wine is light yellow; a little buttery, mineral, with darker citrus (orange/mandarine); broad, full on the palate, with the acidity to match. Traste 2015 (José Aristeguí) is another inland Galician wine, this time from Valdeorras (neighbouring the Castilan region of Bierzo). The grapes are garnacha tintorera (alicante bouschet) and mencía. Dark; rich and warm (15% alc. ), hints of morello, and some coffee; tough tannins, the alcohol shows again in the finish, but it’s not without charm either. 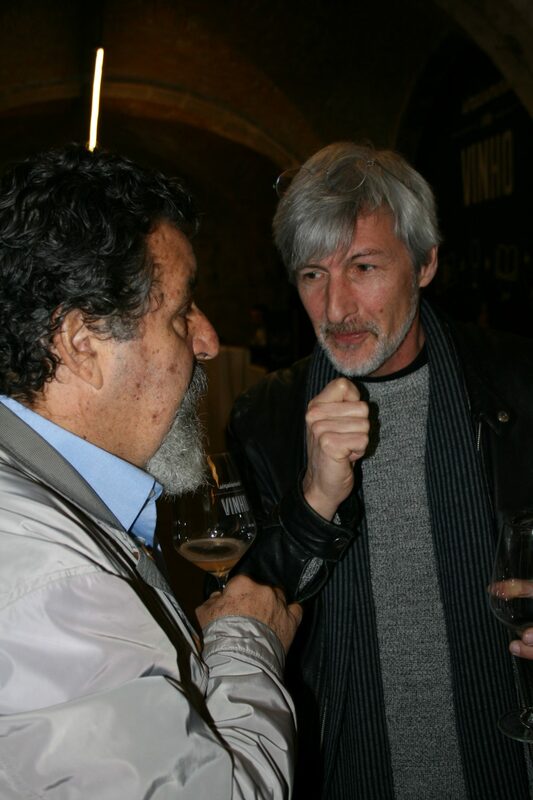 Here we are talking about a collaboration with Raúl Pérez, especially known from Bierzo, Spain. These are stylish wines. Mirandela 2015 (from Tras-os-Montes north) is a white field blend of moscatel-malvasia a.o. : Pear, citrus; quite full, good acidity. Tinto 2010 from tinta amarela, tinta roriz and touriga nacional: Dark; very fresh for a 10, red fruits, good structure. Among the rest from this region the following stood out. Quinta de Arcossó Reserva 2009: Dark colour; dark fruits (morello, blackcurrant); powerful, evident tannins, some alcohol in finish. 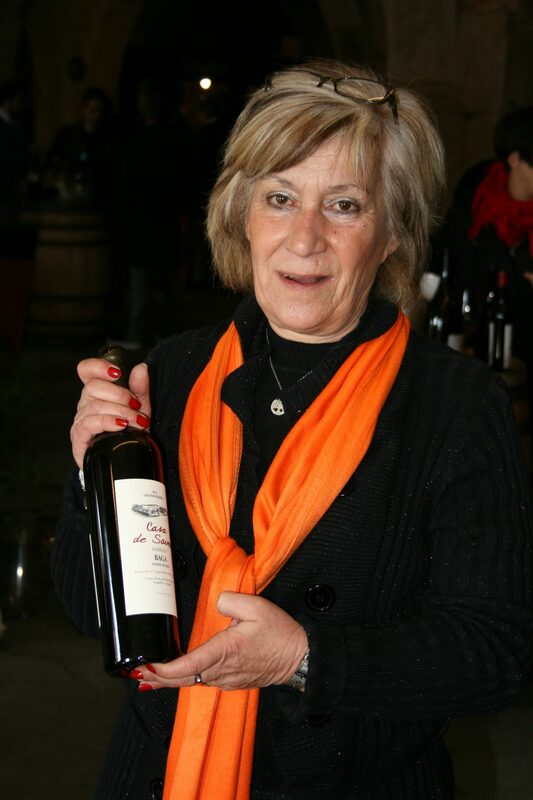 Rita Marques has impressed for some years with remarkably elegant wines for a hot region like Douro. Near Vila Nova de Foz Côa in the Douro Superior her ranges are called Contraste and Conceito, and she also makes some port. Contraste 2016 from various grapes: Light; very fresh, citric, herbs; luscious, soft and natural, with an integrated acidity. Conceito 2016, fermented in barrel, a field blend: Light; white flowers, peach, some vanilla, honey; full on the palate. Ontem (=yesterday in Portuguese) 2016, Terras de Beira, in other words from outside the Douro. 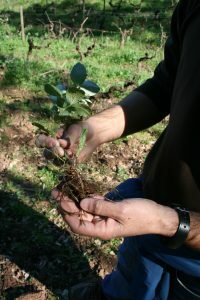 The grape varieties include encruzado and rabigato, and the soils are granitic. It’s a flowery, fruity, full wine with vibrant acidity and evident mineral tones. Contraste 2015: Cherry red; red fruits; soft, some tannnin structure. Conceito 2015: Dark colour; dark and red berries, some vanilla, mint, some toast, but fruit-driven nevertheless. Legítimo 2016: , a carbonic maceration wine: Purple, violet; dark fruits, pepper, a bit lactic; young tannins. Outem 2015, a wine made from baga 60-70%: Bright red; some green pepper, raspberry; cool and fresh, and some structure. The Verdelho family is found near Vila Nova de Foz Côa too, and I have tasted many of their Dona Berta wines through a mutual friend. 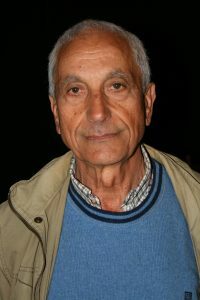 The wines, made by professor in oenology Virgilio Loureiro, I have learned to recognize as well-made wines, more robust than elegant. They are proud of their rabigato, and deservedly so. The Rabigato Reserva Vinhas Velhas 2016 made in inox was full and creamy, with notes of citrus, nuts, wax and melon. Among the other wines worth mention were first Sousão Reserva 2013, dark and fruit-driven, juicy with some spice and lickorice. Then the Reserva 2013, an “entry-level” blend: This is a fresh red, with notes of red berries, plums, an earthy touch, but with a quite elegant structure. Tinto Cão Reserva 2012: A structured wine with red fruits, blackberries, solid tannins and good acidity. This is one of the most northern wineries in the Douro Superior, a really cool place north of Vila Nova de Foz Côa. They work biodynamically, and have organic certification. It’s always spontaneous fermentation, and SO2 only after malolactic and before bottling. Quinta do Romeu 2016: Open, immediate and aromatic, with red fruits and herbs; smooth, glyceric, and a good acidity. Quinta do Romeu Rosé 2016: Light salmon colour; strawberry, gooseberry; fresh, with a good natural acidity. Quinta do Romeu Tinto 2011: Dark cherry red; red fruits; juicy, luscious, cool and fresh on the palate. 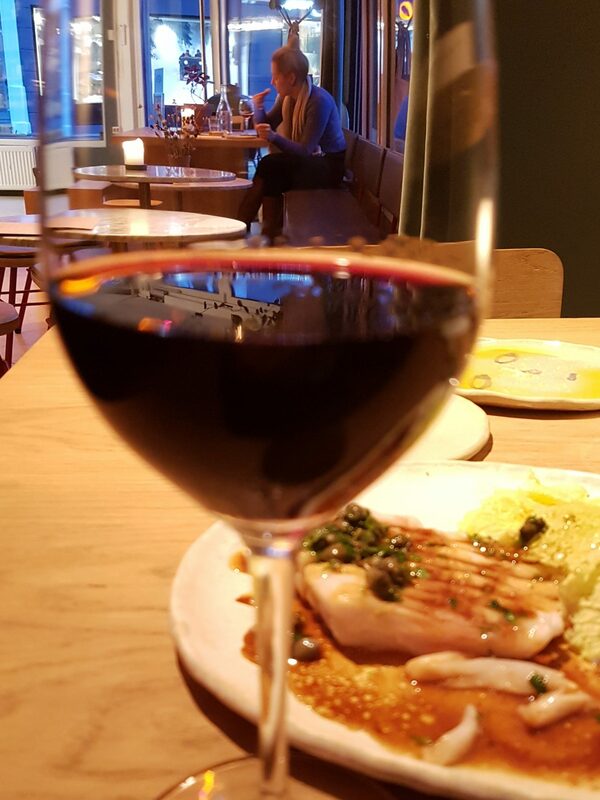 Quinta do Romeu Reserva 2015: Made from touriga nacional, touriga franca and sousão, fermented in lagares of granite, moderate extraction: Dark red; smells of dark berries, tobacco; full on the palate with a good acidity. Quinta do Romeu Touriga Nacional 2015: Dark, dense, violet; aroma of dark fruits with leather; young and robust tannins. They also make a colheita port. Tiago Sampaio is the winemaker of Folias de Baco, a project he started in 2007. He never forgets the roots and the terroir, but it’s always something creative about his wines. And though he can experiment at every stage of the process, the extraction is always very gentle. He is found in Favaios, the traditional moscatel stronghold, in the sub-region of Cima Corgo, and the vines are on schist and granite at an altitude between 500-700m. When he came back from Oregon with a degree in oenology in 2007, he established the brand Olho no Pé. The latest editions however, come under the name Uivo. I tasted a cloudy, fruity and very tasty Uivo Pet Nat from the very early harvested 2017 (started 8. August), a very fresh, flowery Olho no Pé Moscatel from the same vintage, smooth but also with a lovely acidity, and the Olho no Pé Vinhas Velhas 2016, a no SO2, skin contact, barrel-fermented wine with more colour, somewhat tropic, waxy aroma, and a glyceric appearance in the mouth – a wine for keeping. Among the reds there was the Uivo Renegado Tinto 2017 (a field blend with both red and white grapes, so to call it rosé is maybe better), a little turbid, earthy, strawberry/raspberry, and a tough grapefruity acidity, and the light, transparent Olho no Pé Pinot Noir 2014 with raspberry, full and round. Uivo Tinta Francisca 2016, had a deeper colour, very fruity with red berries and plum, juicy and grapey in the mouth, with a graphitic mineral touch. The last wine I will mention here is the impressive Olho no Pé Colheita Tardia 2012, an orange/amber wine with sweet honeyed bouquet from 100% botrytisized grapes. Infantado was the first winery to export directly from the Douro valley in the 1980’s, and I visited them twice shortly after. 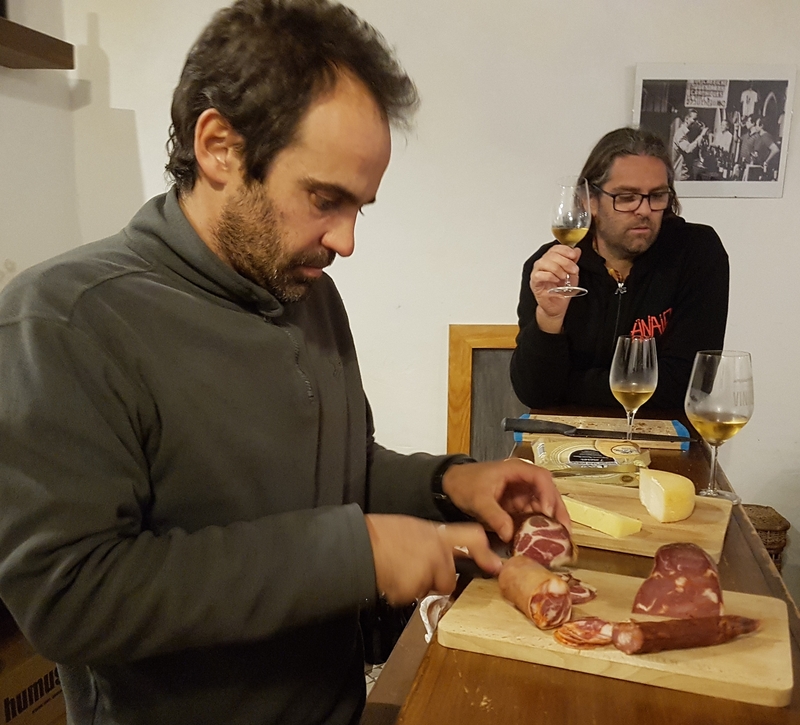 They weren’t given first priority in the tasting hall this time, but at the DOP restaurant of Rui Paula we tasted two ports and the Roseira 2011, a project from Joaõ Roseira of Infantado (and Simplesmente Vinho, of course). Dark colour; red berries and forest fruits; good tannins, still young (good with baby goat). 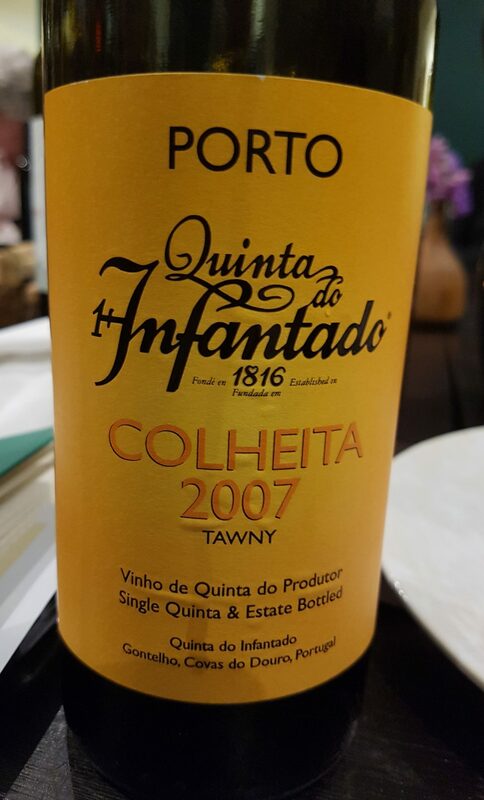 Two well-matured ports: the Colheita 2007, a tawny with vintage, had a young, red colour, beginning developement; figs, nuts, berries, elderberry; fruity, not very sweet, long. Vintage Port 1997 (magnum): Very fruity (blackberry), but also with some chocolate, spices and a warm, raisiny hint. Lots of tannin in the mouth, matching acidity, and still fruity after all these years. 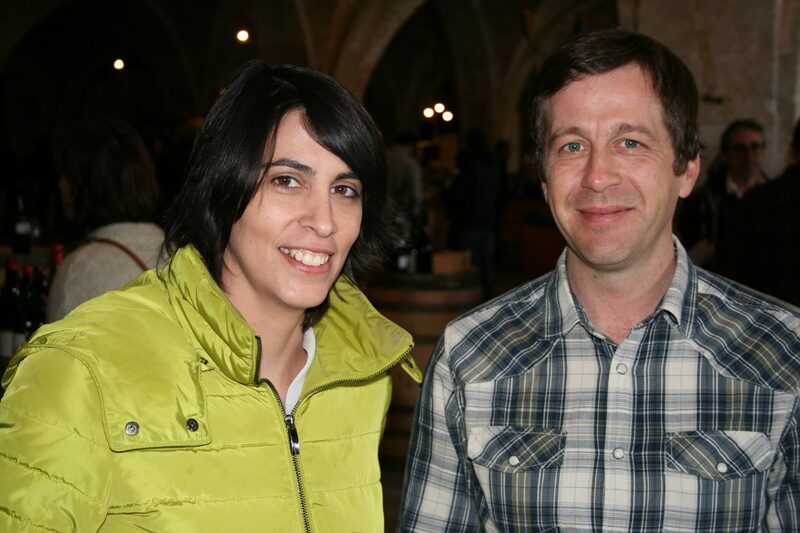 This was an occation to meet the lovely Graça Miranda again, whom I had not seen since I visited the winery in Sangalhos many years ago. Saima was known as a tratitional producer, and I have still a few older vintages in my own cellar, such as the superb Garrafeiras 1991 and 2001, and I remember a foot-trodden rosé with more than 10 years of age when it was released. But they also embraced the new opportunities that appeared some years ago, with new grape varieties such as merlot. The white Vinhas Velhas 2017 (sample) was light; fruity, with citrus and apples; full, concentrated, good acidity, fresh. I think this will be great in a not too distant future. The same wine from 2016 (a hot year) was waxy and herby, but also with fine flower notes; full in the mouth, with a fine acidity. Garrafeira 2015 (the first garrafeira white), made in old oak with 3 months of batonnage in big 3.000L vats: Darker, more creamy, quite waxy, with a touch of honey, concentrated, glyceric, smooth, and long. Promising. The Pinot Noir 2015 I found interesting; fruity and saline. Baga Tonel 10 2014 (10 is the name of the vat [tonel in Portuguese], while 14 is obviously the vintage): Light colour; red berries, forest fruits, some greenness; luscious in the mouth, tannins still come creeping, and a good acidity ends it all. Baga Vinhas Velhas Grande Reserva 2014: Grande Reserva means here that it must be in oak for at least 24 months. The wine is cherry red, has some greenness, good fruit, lots of tannins, and good acidity. Maybe a classic Saima with great ageing potential. 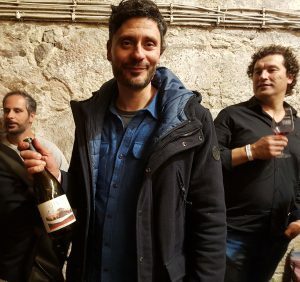 I have known André Pereira of Montalto and Pedro Marques of Vale da Capucha for some years, visited their quintas and met them at fairs, such as the London natural wine fairs. André not only makes good wines, but with an almost unbeatable quality-price ratio. 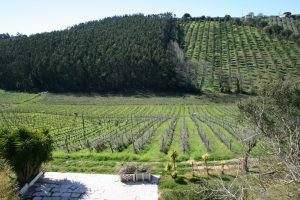 His farm is in Ourém, in the Encostas d’Aire area, some of the vineyards in Leiria, but most of the wines are classified as regional Lisboa. 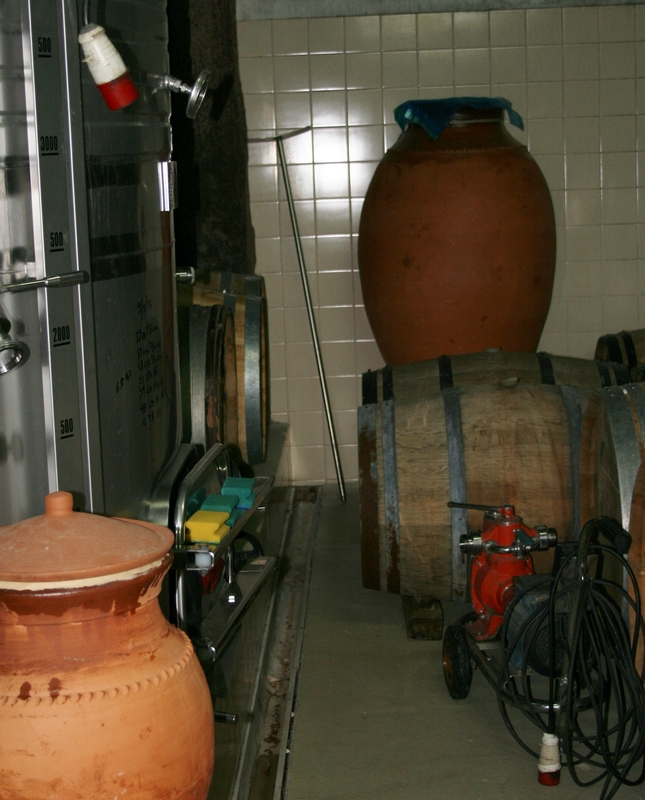 André is currently experimenting with amphora, coated with natural resin. 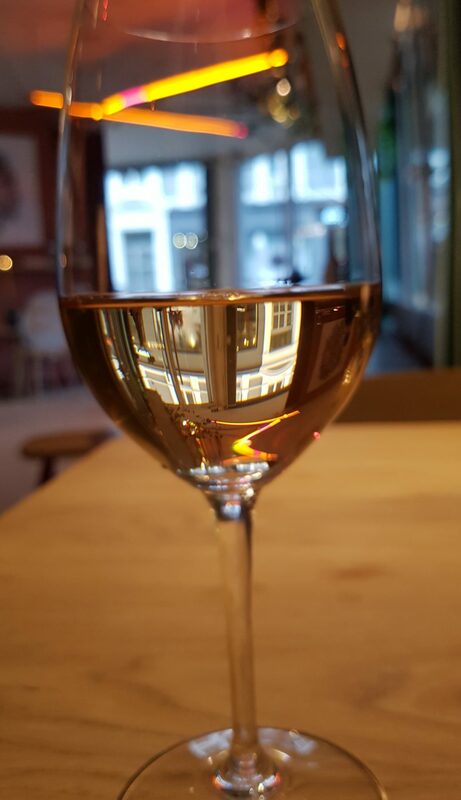 An clay-aged fernão pires from 2017 (the name is to be announced, possibly something with ‘talha’, denoting clay wines in Portugal), harvested early, was light in colour; flowery, fresh, fresh, but also nutty and a bit waxy, and full of life. His Medieval d’Ourem 2017 (DOC Encostas d’Aire) is based on an old Ourém tradition. It’s defined in the strict DOC rules that it must be 20% red and the rest white grapes (here tricadeira and fernão pires). The 2017 was light red, with a lovely raspberry scent; luscious and round, but also with a citrussy freshness. Although the alcohol is 14,5% (spring was hot and dry) this must be the best “medieval” wine I have tasted from André so far. A Touriga Nacional 2017, this one also aged in amphora: Dark, violet; aroma of flowers, red fruits, blackcurrant; a touch of tannin, and also a bit warm at 14,5%. As the name suggests Cepa Pura is a series of varietal wines. Cepa Pura Baga 2016 was totally destemmed, put in 50% used barrel, and the rest inox. 2016 was a difficult year here, with a great loss because of rain and fungus. The wine was nice, with and aroma of red fruits, green pepper, cherry, and some spice; fresh and luscious in the mouth, with soft tannins. 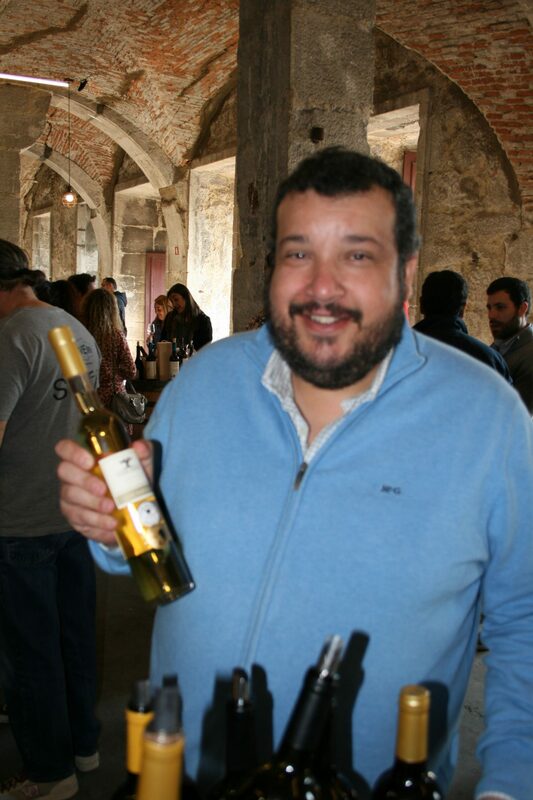 Cepa Pura Fernão Pires Late Harvest 2015: This is another example of fernão pires’ many talents: Yellow colour; aroma of yellow fruits, citrus and honey; semi sweet, rich, and with a good acidity. No botrytis. One of the big revelations this year was Cabeças do Reguengo. They currently have 11 ha. vineyards, in the north of Alentejo, near the São Mamede national park. Rui Felé tells that they encourage the biodiversity, with man, wildlife, olives, other crops and vines in harmony. The grape harvest is all done in a single day and in the cellar there is very little intervention. The only product used is a little SO2. The wines stay in old oak, and in the near future only black oak – the autochthonous species. One of the wines that stood out was an orange wine called Luminoso 2016. It’s made from arinto, fernão pires and rupeiro, had 10 days skin-contact, no SO2. The colour is orange/amber; aroma of peel, nectarine, mandarine, a touch of honey; full, structured (tannin), and fruit all the way. The red Felisbela (“my mother”, says Rui), no SO2: Dark cherry; dark fruits, blackcurrant, forest fruits; a bit carbonic, a feature that matches the slightly warm fruit. Courelas da Torre 2015, aragonêz, trincadeira, alicante bouschet: dark; mature fruits, blackcurrant, round, full, some lickorice. There was also a pleasant rosé, quite dark and with some structure: Courelas da Torre Rosé 2016. Under the Cabeças label came wines like Equinocio 2015, aged in mainly old wood for one year: Some butter, nuts, and full on the palate. Seiva 2014: Red and dark fruits, concentrated flavours, long. Solstício 2015, made with whole bunches: Dark colour; wild fruits; rich and a bit tannic. Quinta do Mouro is one of the famous producers of Alentejo, based in the northernly Estremoz, and one of the few (maybe together with Herdade do Mouchão) who strongly believed in the variety alicante bouschet at a time with castelão (locally called periquita) was popular with both producers and local wine authorities. I meet Miguel Louro father and son, the father fronting Mouro and the son both this and his own project. Mouro is about as good as Alentejo gets, and they have a freshness that is difficult to achieve if you’re not located near the mountains in the Portalegre sub-region. So here are a few, only briefly described (partly because I visited them late in the evening when the crowds came in and the music was turned louder, and I actually was “on my way” back to the hotel for a rest). 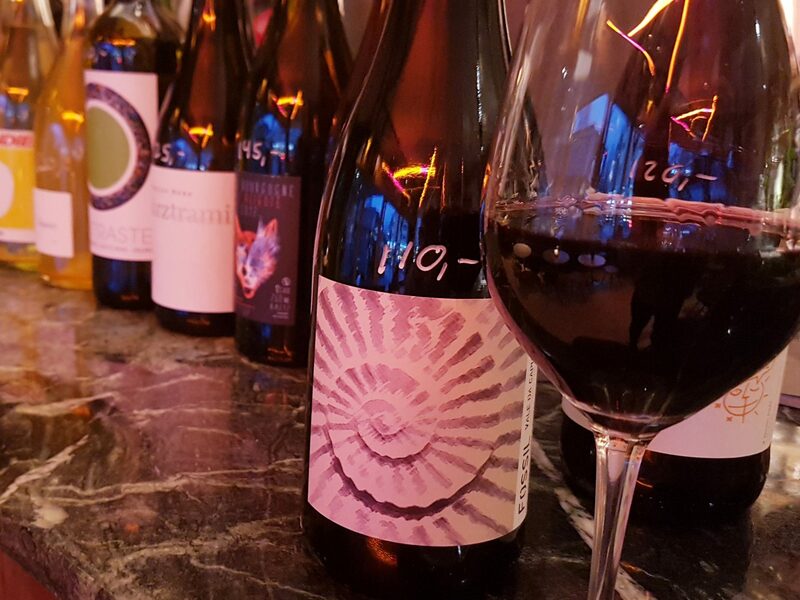 From Miguel junior’s project Apelido 2016, a fresh and clean white, a wine with the 1 o (primero =first) symbol), Nome 2016, full, rich on glycerine, with good acidity, and Apelido 2015, a dark, fruit-driven red, also with some earthy notes. Some brief notes on the Mouro range too: Zagalos Reserva 2013: Dark colour; wild fruits, blackcurrant, blackberry; full in the mouth. Quinta do Mouro 2012: Dark; red and dark fruits, balsamic (menthol); full and complete. Quinta do Mouro (Goliardos) 2012, a wine made with some cabernet in the blend, various types of oak, in collaboration with the Goliardos (see an interview with Silvia here): Very dark, dense, almost opaque; still cool fruit, balsamic: a lot of tannins, but not aggressive at all. Before this week I had known this producer mostly for his entry-level Rufia! wines (such as the one mentioned here). That is totally changed now after a visit, complete with dinner, breakfast and and overnight stay in João and Luisa’s agro-tourism facilities. Now I have come to know a man with deep knowledge, not only of vinegrowing, but in many other fields, such as culture and cooking, and one who loves the sport of discussion. He refreshed my memory too, as we had in fact met at a tasting of Dão rosés many years ago. João Tavares da Pina’s farm Quinta da Boavista is located outside Penalva do Castelo, Dão. We are in a cool climate around 500 meters above sea level, and the soil is clay shale (from marine sediments) and a small percentage of the, for Dão, usual granite. This mixture gives both freshness and mineraliy. Some more key words are recovering of endangered grape varieties, biodiversity, no-till, manual harvest, chamomile or lavender at the beginning of a vine row, spontaneous fermentation and only a small dose of sulphur. João looks for freshness, that’s true, but also the decadent underwood aromas, and mushrooms. To achieve this he uses high fermentation temperatures (32°C is not unusual). Also, the jaen grape is well suited to this area’s longer growing season. The 1997 was the first wine after having decided not to sell all the grapes to the cooperative. This is a blend of jaen and touriga nacional, around 60-40. Red colour with some evolution. Forest fruits, aromatic herbs and mushrooms. Fine structure, with just the right touch of tannins and acidity. Long and elegant. I would say fresh, and definitely full of life. Dão can age, that we knew from producers like Quinta da Falorca, Buçaco (a Dão and Bairrada mix), blended wines from negociants like Caves S. João a.o. The other day I came across a well-aged wine from Álvaro Castro, from his vineyards bordering the Serra da Estrela national park. It’s a 50/50 touriga and tinta roriz. I am not quite sure why he calls it Pelada, as one of the vineyards from which he sources the grapes is called Pellada, with a double l. Anyway a drawing of a “peeled” (pelada) lady aptly adorns the front label. Deep cherry colour, brownish rim. Dark fruits on the sweet side (towards compote), blackberries and plums, a touch of dried fruits. Cool, integrated acidity, rounded tannins. Aged with grace; for me it will not improve, although I know people that will disagree. Back on the Café Tati, near the entrance of the Lisboa river market. (See another report here.) This is a small, not too easy to find, bar with lovely natural wines to wash down the tasty, small bites. This evening there were no live music, so we had to do with Duke Ellington and Van Morrison on the sound system. Coming directly from Bairrada it would have been be nice to continue with, say Tiago Teles’ wonderful wine, that he makes in the bigger producer Campolargo’s winery. But there is always something good served by the glass too, so I went for Humus white from the Lisboa region and the Rufia! red from Bairrada’s inland neighbour Dão. 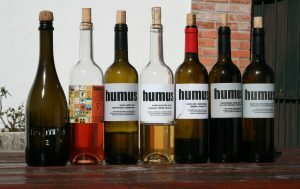 The Humus wines have their origin one hour north of Lisboa, near Óbidos by the Atlantic. It’s an area with cooling sea breezes and high humidity. This ensures a longer maturing period and a good acidity level. 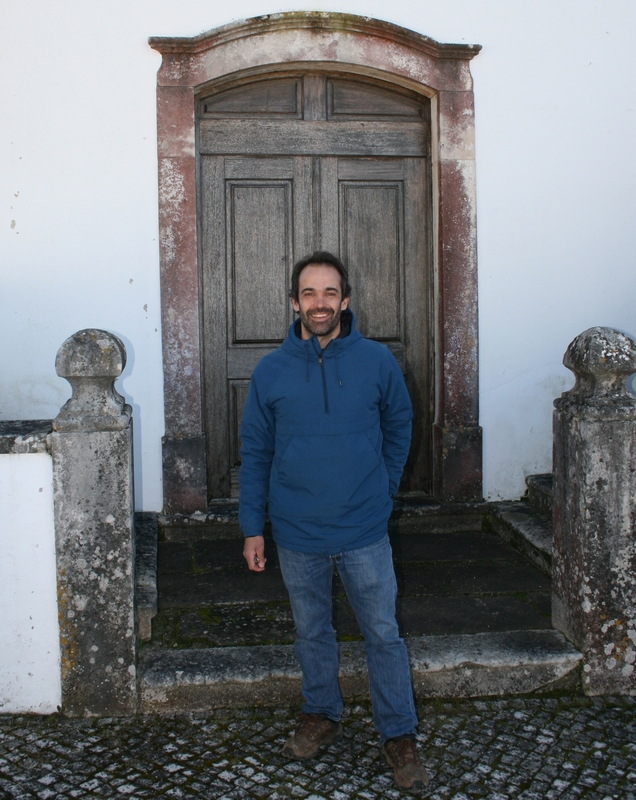 Rodrigo Filipe makes minimalist intervention wines from organic fruit from his family’s 5 hectar estate. He does a direct pressing for the white. Nothing is added to the wine, except maybe a small amount of SO2. All the wines are bottled without any fining or filtration. Up in Dão João Tavares de Pina is the man behind the Rufia wines. They are made from a 500-550m vineyard in Penelva do Castelo on granite, schist and clay soils. It’s a low sulphur, low extract, low oak wine. The grapes are jaen, touriga nacional and rufete. He normally ferments the varieties together in open stainless steel lagares without temperature control. Ageing is done in stainless steel tank for some 9 months on lees, and on to more than 10 years old barrels after malo-lactic. Deep yellow. Aromas of orange peel, citrus, melon, chalky minerals. Full yet fresh on the palate, with a chalky minerality. Dark ruby red. Lovely fruit, cherry, raspberry. Fresh and juicy in the mouth, round tannins and a good level of acidity. Portugal came somehow in the shadow of the many Spanish contributions of the fair. However there were some old favourites. Alvaro Castro continues to do an excellent job near the Serra da Estrela national park. Two of my favourites are his lovely, fresh young Saes Dão 2015 from a traditional Dão blend -dark berries, mountain vegetation, a touch of spices-, and its more ambitious touriga-based brother Quinta de Saes Reserva 2012. From Douro I had the pleasure to retaste one of Niepoort‘s bestsellers, a typical Douro blend that changes its name according to market. If I remember right it started in Germany as Fabelhaft, and in Norway it’s translated into Fabelaktig, now in the 2015 vintage. This one too is a fruity, almost silky red, with aromas of red berries, some spice and just a slightly sweet oak-tone. 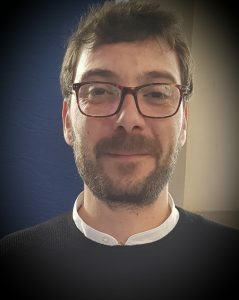 Luís Seabra was represented by Xisto Ilimitado 2014. His project is characterized by a wish to express the terroir, low-intervention vinification, ageing in big, used vats. 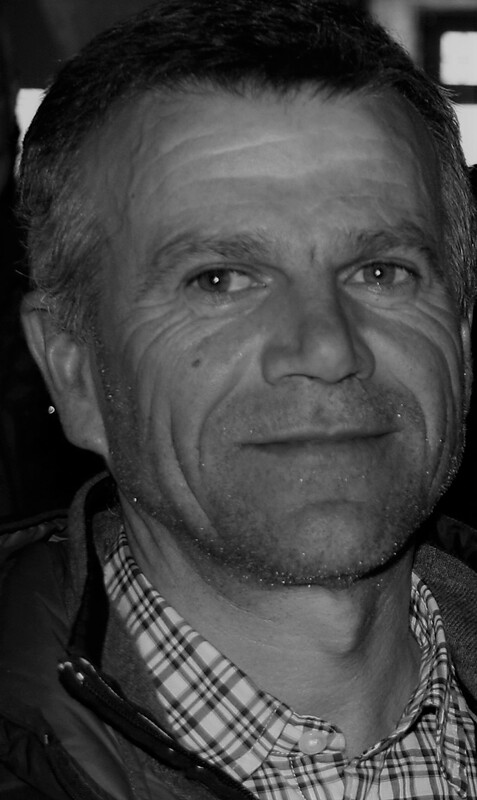 His favours were hired by Dirk Niepoort a.o., but he finally choose to go solo and made good wines from his first vintage in 2013. This wine was dark, with cool fruitiness, a little spicy, surprisingly light, but with just enough structure to bind it nicely together. As the name suggests the wine has a mineral touch, and the acidity gives it a long and lingering farewell. Luís Pato was represented by no less than twelve wines. Pato lives and works in Óis do Bairro in the Bairrada region, but for political reasons he chose to declassify his production some years ago. The wines are obviously at a high level, and among the many wines I appreciated this particular evening were two of his whites, the Maria Gomes Branco 2014, golden, rich, glycerine-full and a hint of citrus and tropical fruits, and the Vinhas Velhas Branco 2014 (50% bical, the rest sercial and sercialinho), more concentrated, slender, with notes of green apples, yellow plums and a stony minerality. Among the reds I will limit myself to mention three wines, the Baga Natural 2012, a relatively new wine in the portfolio, a no-sulphur-added, expressive, fruity and a little earthy wine in the lower end of the price-scale. Another budget wine is the Colheita Seleccionada 2013 (baga with touriga nacional), unoaked, cherry red, with red fruits and herbs. Then there was the Vinhas Velhas 2011, nowadays more on the fruity side and less woody than it used to be, although it has seen big French barrels for a year. I have recently tasted ’90 and ’95 versions of the wine, both still drinking very nicely. This wine is for considerably shorter shelf-life. All right, I’ll give you one more, the always lovely Vinha Pan, now in the 2013 vintage. This chalky clay-vineyard is harvested twice, first for rosé and sparkling wines, then one and a half months later to give this red wine, relatively dark, with red fruit aromas, decadent underwood, mushrooms, and some notes in the balsamic/lickorice direction. Very “baga”, very good. Conventially made ports was not the focus of my visit, but I couldn’t avoid noticing that Symington was present. I am aware that choosing the 2004 vintage may seem a bit strange, since this producer has launched a couple of more recent vintages, like 2011. On the other hand, the ’04 is still in the market and better than ever. I visited Arlindo da Costa Pinto e Cruz last in 2010, when this picture was taken. The winery is located in Casais do Douro in the municipality of São João da Pesqueira, on the south side of the Douro, along the river Torto. Schist is the predominant soil in their typical terraces found all over Alto Corgo. Casal dos Jordões dates back to 1870, and has always belonged to the Jordões family. 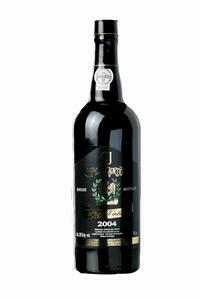 Jordões must have been the first port producer in Douro with organic farming certificates. I even remember a rosé port from my last visit. The wine is made from the normal port grapes (touriga nacional, touriga francesa, tinta roriz and tinta barroca) sourced from their main vineyard and a couple more along the Rio Torto. It’s made with the typical port process, with addition of brandy, kept in barrel for less than two years – and when bottled it has never been clarified nor filtered. Deep dark, showing some development. Mature dark fruit (blackberry, blackcurrant), nutmeg, some chocolate, and a touch of dried fruit. Rich and smooth on the palate, but not too sweet, very persistant. An excellent port from an “off-year” (Arlindo said everybody could make a good vintage port in 2003, so for him that was no challenge…), and it will still age beautifully.